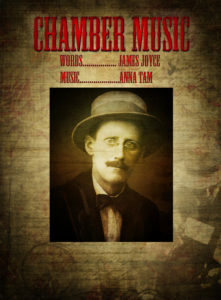 A new setting of the poem cycle ‘Chamber Music’ by James Joyce for tenor, soprano and broken consort of lute, renaissance flute and viola da gamba. Begun in Dublin on May Day 2012 and completed on my boat Good Friday 2013, Chamber Music premiered at the Brighton Fringe Festival on 10th May 2013. Written between 1901 – 1904 and published in 1907 is a volume of 36 poems Yeats described as of ‘a young man who is practising his instrument, taking pleasure in the mere handling of the stops’ and indeed there are many clear influences present such as that of the Romantic poets, Elizabethan lyric and Irish folk song. Joyce would continue to experiment with form throughout his life. Chamber Music reveals the sentimental side of Joyce he strove so hard to control. He nearly cancelled the publication saying ‘All that kind of thing is false’ however in 1909 he sent a parchment copy to his future wife Nora Barnacle with their initials intertwined on the cover. Joyce was an excellent tenor who loved Elizabethan music. He thought of Chamber Music as a suite of songs and hoped – a hope now fulfilled – that they be set to music by ‘someone who knows old English music such as I like.’ In 1904 Joyce tried and failed to procure a lute in order “to coast the south of England from Falmouth to Margate singing old English songs” making instrumentation of the work and the location of its premiere very fitting. There have been several public performances, but as yet there is no recording of the song cycle. If you would like to donate to support the project please click the Paypal button below. Any amount is gratefully received; you will be sent a copy of the recording when it is made and your name will be in the accompanying booklet.